Castleford head coach Daryl Powell has named his 19-man squad to face Leeds Rhinos on Good Friday at the Mend-A-Hose Jungle, kick-off 12.45pm. 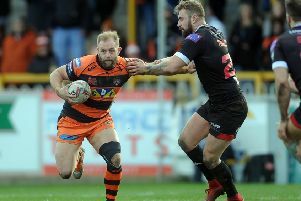 Forwards Matt Cook and Nathan Massey return after serving their one match bans while full-back Luke Dorn has recovered from a nasty facial cut picked up during the Salford match and is back in the squad after missing last week’s game against Hull. Junior Moors and Mike McMeeken are missing from last week after picking up knocks.